« Freeport Lodging Specials – Fall Freedom! This year, however, after the summer months have faded away, Coastal Maine Botanical Gardens are offering a new, off-season reason to visit: Gardens Aglow! From November 21st to December 31st, Thursdays through Sundays, 4pm to 8pm, visitors will once again have the opportunity to explore the gardens – but now bedecked with thousands of lights for Gardens Aglow! Coastal Maine Botanical Gardens plan to create the largest light display in Maine, right here in the already beautiful gardens, is like a seasonal cherry placed atop an already perfect dessert! And it’s not just creatively arranged lights. Other holiday-themed festivities are set to include music, special, seasonal food and drink offerings in the Kitchen Garden Café, and some great holiday gift shopping at the Coastal Maine Botanical Gardens Gift Shop. Thus you and a friend can make an afternoon of it: have a nosh and a cocktail, enjoy the beauty of the delightfully spangly and festive gardens, and do a bit of Christmas shopping: perfect! Coastal Maine Botanical Gardens – Gardens Aglow! 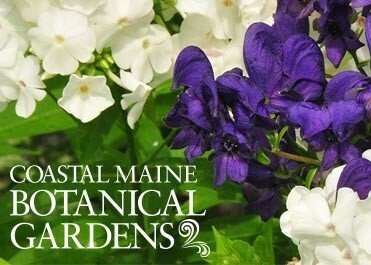 Just 40 minute’s drive from our bed and breakfast – and worth every minute of the drive – Coastal Maine Botanical Gardens are just one more reason to quit procrastinating and take that coastal Maine vacation you’ve always hoped to. When you do, be sure to make your visit the best it possibly can be with a stay at Brewster House Bed & Breakfast in conveniently located, relaxing Freeport, Maine.